Tickets are available now to see Be More Chill at the Lyceum Theatre on Broadway. Be More Chill has rapidly become a musical phenomenon amongst young theatre fans across the country… even before it opened on Broadway! Be More Chill went viral, so to speak, and generated the kind of online buzz on YouTube and various social media platforms that regional productions can only dream of. Even before its New York premiere, the musical’s cast recording had been streamed well over 150 million times and on Tumblr, it ranked as the second most talked-about musical on their site (behind Hamilton). Its central themes of teenage angst and cyber escapism had obviously struck a chord with a young, enthusiastic demographic across the States and a New York premiere was just a question of time. Having accumulated so much momentum thus far, surely the production’s final off-Broadway performance on September 30, 2018 couldn’t be its last? Certainly Not. The bright lights of Broadway were beckoning and a multi-million-dollar transfer was announced, with previews beginning at the Lyceum Theatre on February 13, 2019, ahead of an official opening on March 10. Months before the Broadway opening, a film adaptation of the novel and musical was also reported to be in development, with Shawn Levy and Greg Berlanti listed as producers. Based on the cult sensation novel by Ned Vizzini, Be More Chill is the story of Jeremy Heere, your average, nothing-special teenager at Middleborough High in nothing-special New Jersey. That is, until the day he finds out about "The Squip." Thus begins a journey that pits Jeremy's desire to be popular against his struggle to remain true to his authentic self. Be More Chill is an honest, edgy, super-hilarious look at coming of age in the digital age, set to some of the most exciting songs in contemporary musical theater. This original musical comedy looks at modern issues like depression, bullying, and anxiety through the lens of sci-fi films of the 50s, horror flicks of the 80s, and teen movies of the 90s. Little Shop of Horrors meets The Breakfast Club in this celebration of outcasts, teenaged or otherwise. Producers of the Broadway premiere of new musical Be More Chill, directed by Stephen Brackett, have now releassed official production photos, depicting Broadway cast members Will Roland (as Jeremy), George Salazar (as Michael), Stephanie Hsu (as Christine) Gerard Canonico (as Rich), Katlyn Carlson (as Chloe), Tiffany Mann (as Jenna), Lauren Marcus (as Brooke), Britton Smith (as Jake) Jason SweetTooth Williams (as Mr. Heere / Mr. Reyes / Scary Stockboy) and Jason Tam (as The Squip). The highly anticipated Broadway premiere of new musical Be More Chill begins previews at the Lyceum Theatre tonight, ahead of an official opening on March 10, 2019. The entire cast of the off-Broadway production of Be More Chill will transfer uptown in the show’s Broadway premiere at the Lyceum Theatre, beginning previews on February 13, 2019, ahead of an official opening on March 10. The cast of Be More Chill includes Will Roland (as Jeremy), George Salazar (as Michael), Stephanie Hsu (as Christine) Gerard Canonico (as Rich), Katlyn Carlson (as Chloe), Tiffany Mann (as Jenna), Lauren Marcus (as Brooke), Britton Smith (as Jake) Jason SweetTooth Williams (as Mr. Heere / Mr. Reyes / Scary Stockboy) and Jason Tam (as The Squip). Be More Chill couldn’t be hotter. 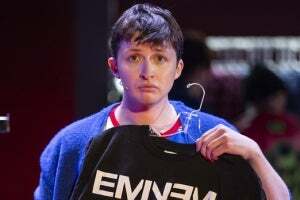 The musical theater sensation went from being a flop in a little theater in Red Bank, NJ in 2015, to a viral internet sensation in 2017, that has over 170 million streams of its cast album today, and, finally, a Broadway run that opened March 10, 2019 at the Lyceum Theatre. This is not the usual route for a Broadway musical.